Highton is a residential suburb on the south-west side of the Barwon River, 4 km from central Geelong. It was named after John Highett, Highett-town having been shortened to Highton. Highett arrived in the district as a grazier in 1836-37. He built Highton house on Montpellier hill overlooking the river. It later became the Montpellier vineyard, hotel and picnic ground. (Highett had a brother, William after whom the Melbourne suburb of Highett was named). Highton is on the eastern edge of the Barrabool Hills. Near the intersection of Barrabool and Scenic Roads an Anglican church and school (1854) were opened. A Wesleyan church was opened in 1855. The Barrabool Hills Cemetery is to the east of the intersection, and Montepellier hill 500 metres northwards. The district was extensively subdivided by the mid-1860s, with a hotel, a post office and a population of about 300 persons. There were several vineyards. 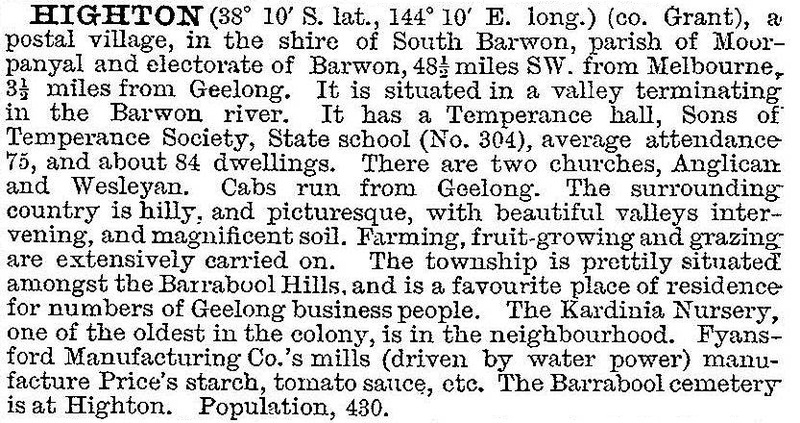 Highton continued as a rural district until Geelong’s residential expansion reached it in the mid-1950s. The notable event in its history was the destruction and damaging of several buildings, including the two churches in 1926, by a sudden storm. In 1927-28 St Catherine’s Catholic girls’ orphanage was opened and in 1939 the St Augustine’s boys’ orphanage was moved from Newtown to Highton. The Glastonbury Children’s Home (formerly Geelong Orphan Asylum, 1854, Herne Hill), was also transferred to Highton in 1933. (The name came from the orphanage’s association with the family of James Austin, a Geelong land owner who acquired Glastonbury Abbey on the Island of Avalon in England in 1861). The former South Barwon city council offices were beside Glastonbury. Highton emerged as an ‘ideal and expanding residential suburb’ by the late 1950s, with a bus service and community facilities. Bellarine and Montpellier primary schools were opened in 1963 and 1969. The Belmont high school, on Highton’s eastern boundary, was opened in 1955. Highton’s elevated location has resulted in three reservoirs being built there. There are also neighbourhood parks and Queens Park at its northern boundary along a bend of the Barwon River. Roslyn Street and Barrabool Road have Highton’s civic centre with the original State primary school (280 pupils, 2014), the old Anglican and Wesleyan (Uniting) churches, Highton Reserve, the shopping centre and the library. St Augustine’s and Glastonbury in the south of Highton have been replaced by the Christian College’s campuses (1980). Highton has two Baptist churches, Barrabool Hills and South Valley. There is considerable land under development on the north-west of Highton adjacent to the Princes Freeway (Geelong Ring Road).